Not all turkeys are the same, yet over the years the ones that end up on Thanksgiving tables increasingly have been. Americans’ love of big birds with tons of white meat has led to the ubiquity of one type: the Broad Breasted White. 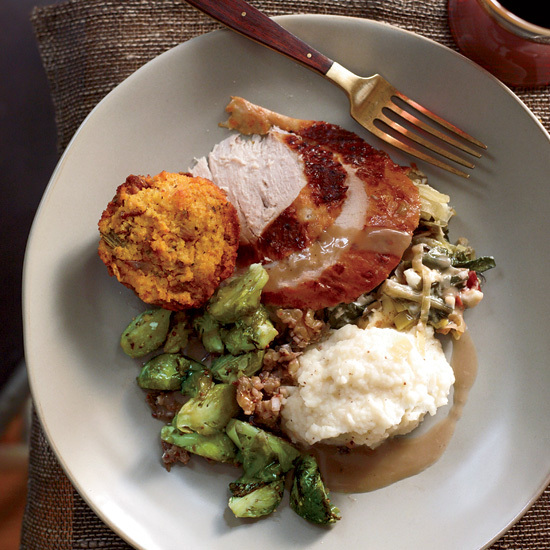 So great is our obsession that more than 99 percent of American turkeys come from just a few strains of that breed. Modern Farmer took a look at “How Turkeys Got Broad White Breasts.” The answer is not particularly surprising. When improvements in transportation made shipping turkeys simpler, farmers took advantage by charging by the pound instead of by the bird, and breeding each one to be as full of as much meat as possible. This change matched consumer attitudes. “Americans consistently choose lower prices and greater quantity in their food,” explains culinary historian Andrew F. Smith. Couple that with our country’s predisposition toward homogeneity, whether it be with our strip malls, our Starbucks or our Thanksgiving meals, and suddenly a diverse group of heritage turkeys with names like Bourbon Red and White Holland gave way to just one single type of bird. The repercussions aren’t just that most turkeys now have less flavor, which according to Smith “seems to be of little interest, for consumers usually add flavoring and condiments.” But as with most overbreeding, it’s bad for the birds themselves. Out of 10 species of farm animals looked at by the Livestock Conservancy, the organization is quoted as saying “none is more genetically eroded than the turkey.” Sadly, Broad Breasted Whites carry so much bulk they can’t even reproduce without human intervention, not to mention that lack of genetic diversity leaves them more prone to disease. As Modern Farmer astutely states, “We consumers think of turkeys not as farm animals, but just another mass-produced item on a shopping list.” The local harvests that made the first Thanksgiving possible has given way to a national turkey industry that drops more than enough frozen birds to go around at every grocery store in the country. They all look and taste exactly the way a Thanksgiving turkey is expected to. But changing those expectations could bring us tastier, healthier birds, which would be good for both the turkeys and for us.